Ohsweken, Ontario – July 11, 2013 – Ohsweken Speedway’s 18th season of racing continues this Friday, July 12 when Best Western Cairn Croft Hotel and Kool Kidz Ice & Water present Canadian Diabetes Foundation night, featuring the Corr/Pak Merchandising Sprint Cars vs. the Empire Super Sprints tour, plus Affordable Towing & Recovery Thunder Stocks, HRW Automotive Mini Stocks, Gale’s Auto Aftermarket Bombers, and the only appearance of the season for the Vintage Cars. This Friday features the second of three challenge events this season between traveling Sprint Car series and the regulars of the weekly Corr/Pak Merchandising Sprint Car division, with a $1,600 prize on the line for the feature winner. 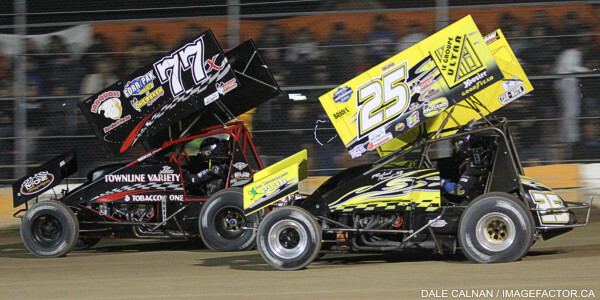 The New York-based Empire Super Sprints tour drivers are the foes for Corr/Pak drivers defending home turf this time, but a familiar face will be among the invaders. New Yorker Jason Barney won the most recent challenge event with the Patriot Sprint Tour at Ohsweken in June. Barney charged from 17th to take the win that night, and intends to be back this Friday. Quebec’s Michael Parent is the current Empire Super Sprints championship leader, and has 3 ESS feature wins this season, including 2 during the recent Central New York Speedweek. Fellow Quebec driver Steve Poirier has 5 career feature wins at Ohsweken, including 3 in the Canadian Sprint Car Nationals, and is currently 2nd in the ESS standings. New York drivers Chuck Hebing, Lance Yonge, Kevin Ward Jr., Dylan Swiernik, Jeff Cook, and Joe Trenca are among other ESS regulars expected at Ohsweken on Friday. 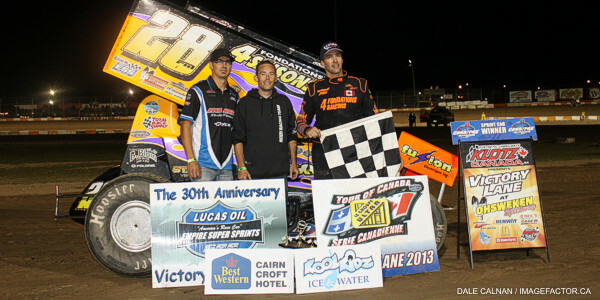 2011 Corr/Pak champion Jim Huppunen will lead Ohsweken’s weekly Sprint Car drivers in defending their home turf. Huppunen currently sits atop the Corr/Pak standings, followed by Jamie Collard, Glenn Styres, Mitch Brown, Shane Ross, Todd Hoddick, 2012 champion Chris Steele, Derek Jonathan, Jamie Turner, and 2008 champion Keith Dempster. Collard won last week’s feature at Ohsweken, and also has wins at South Buxton and Brighton, while Styres has claimed 3 Corr/Pak wins already this season, along with a win at Brighton. Normally the sponsor of the “Top Gun” award on regular Friday nights, Nathan Ackland State Farm Insurance will present the ESS Dash this week. The Thunder Stock standings tightened up last week, as Cory Turner saw his points lead shrink to just 8 markers over Lee Winger. Chris Dickie is 3rd and just 19 points behind Turner, while defending champ Mike Thorne is 7 points behind Dickie, and Jim Lampman is just 4 points behind Thorne. Wyatt Van Wart won last week’s feature, and moved into the top 10 in the standings as a result. A pair of rookies lead the way in the Mini Stock standings, as Davey Boughton won another feature last Friday, and extended his points lead over Alex Schuts as a result. Robin Elliott, Jason Lungaro, and Laura Hughes make up the rest of the current top 5. Jesse McDonald took his second win of the season last Friday, and reclaimed the points lead as a result. McDonald leads by 6 markers over Dusty DeBoer, while Max Chechalk, Tim DeBoer, and Brady Longboat round out the top 5. 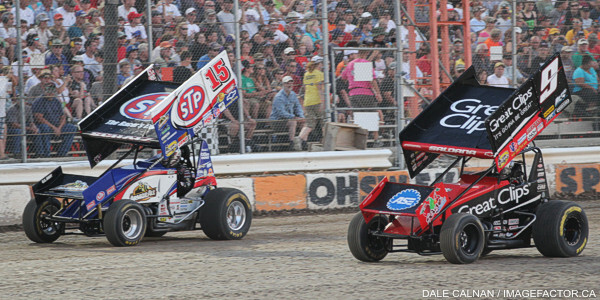 Advanced reserved seat tickets are now on sale for the “Northern Summer Nationals” featuring Tony Stewart on Monday, July 29, the World of Outlaws Sprint Car series “Six Nations Showdown” on Tuesday, July 30, and the 9th annual Canadian Sprint Car Nationals on Friday, September 13, and Saturday, September 14. Please visit www.OhswekenSpeedway.com and check out our new system for online ticket sales, or purchase your tickets at the track by Visa, Mastercard, or Debit card starting this Friday, July 12! The TUSA Canada West Mod-Lites were scheduled to part of the event which was cancelled due to inclement weather on June 28. Ohsweken Speedway officials are happy to announce that the Mod-Lite tour been rescheduled to join the “Labour Day Special” presented by Nathan Ackland State Farm Insurance on Friday, August 30. About Best Western Cairn Croft Hotel: Located on Lundy’s Lane in Niagara Falls, the Best Western Cairn Croft Hotel is one of the city’s most popular courtyard-style hotels. The Cade-family owned facility is located just minutes from many of Niagara Falls’ most popular attractions. For more information, please visit www.CairnCroft.com. About Kool Kidz Ice & Water: Located at 2220 Chiefswood Road in Ohsweken, Kool Kidz Ice & Water can be reached by phone at (519) 445-0292. Ohsweken Speedway’s 18th season of racing continues this Friday, July 12 when Best Western Cairn Croft Hotel and Kool Kidz Ice & Water present Canadian Diabetes Foundation night, featuring the Corr/Pak Merchandising Sprint Cars vs. the Empire Super Sprints tour, plus Affordable Towing & Recovery Thunder Stocks, HRW Automotive Mini Stocks, Gale’s Auto Aftermarket Bombers, and the only appearance of the season for the Vintage Cars. Weekly Friday night racing at Ohsweken offers affordable, exciting, family entertainment just a short drive from many Mid-Western Ontario locations. Adult general admission for this week’s special event is $15, while admission for seniors and students is $12, and kids age 12 and under are admitted FREE! Spectator gates open @ 6:00pm, with the first race taking the green flag at 7:30pm this Friday, July 12! Visit the new official Ohsweken Speedway website at www.OhswekenSpeedway.com and Feel The Excitement!